We needed a break from the dramatic nonsense that’s been happening on The Flash, and nothing makes for a better break from dramatic nonsense than singing, dancing, happy nonsense! Oh, bless you, musical crossover episode. I was getting weary and you have revived me. IT’S LIKE A DRUG THAT YOU USE THAT TURNS PAIN INTO SHOES AND YOUR SHOES INTO DANCE! Our crossover begins in flashback, with little Barry watching Singin’ in the Rain with his mother. She gives her take on musicals: talking is just talking, but singing is opening your soul and letting your true self shine through. Hey, I buy it. But then again, I’m a huge fan of musicals. Modern Barry is watching the same movie while wallowing in his post-break-up funk, and this is important because it shows how important musicals are to Barry. We later find out that Kara also loves musicals, which is why their Music Meister universe ended up a musical. My only complaint is that, aside from one line in Supergirl where Kara tries to get Mon-El to watch a musical, we don’t get the sort of establishment with her that we do with Barry’s story. 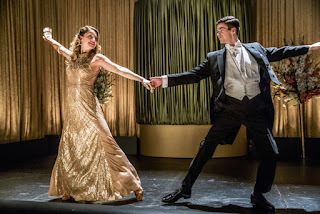 Sure, we’re told that Kara’s go-to musical is The Wizard of Oz, and she does make a lot of references to it, but it would have been nice if the Supergirl episode leading into this crossover had spared a bit of time and featured post-break-up Kara enjoying her feel-good movie musical just like Barry does in this episode. Barry’s sadness is interrupted by a call from H.R., and he and Cisco head to S.T.A.R Labs to check out the breach that just opened up. Turns out, it’s Supergirl! And she’s unconscious, being carried by Mon-El and — because Mon-El needs adult supervision at all times or he’s liable to blow something up, then try to hide the charred remains under a rug — J’onn is with them. They give Team Flash a summary of the last minute of Supergirl’s episode: Music Meister showed up and knocked Kara out, then hopped through a breach to chase after the Fastest Man Alive. Barry still gets that title? I thought we established that Wally is faster. Music Meister shows up on Earth-1, Barry and Wally go after him, and he whammies Barry just like he whammied Kara. Barry comes to in the middle of a snazzy club, wearing a snazzy suit, listening to Kara snazzily sing “Moon River” on a stage. With the unusual helpfulness of clear-cut, hastily-written musical plots (the music is what’s important, people! ), John Barrowman shows up as Cutter Moran to give Barry and Kara a quick summary of their musical lives: he owns the club they’re in and is also a gangster, they work for him, and they’re both singers who need to get some original numbers or else it’s curtains for them, see? Curtains! Yeah, everyone talks like stereotypical gangsters in this reality. It’s great. Speaking of wacky accents: Jeremy Jordan appears not as Winn Schott, but as the club’s piano player, Grady, and his accent is truly hilarious. His introduction happens in order to guide us all into the first big musical number of the episode. With the help of Music Meister himself and “not Cisco” waiter/Dreamer-of-Bigger-Things Pablo, we get a fun, bright, and energetic rendition of “Put A Little Love in Your Heart” and it is absolutely beautiful. Barry looks delighted by the theatrics happening before him in his Music Meister-manufactured reality, because someone (and I’m not sure if it was a decision made by the writer, the director, or Grant Gustin himself) decided that Barry was going to watch every musical performance with complete, unashamed (get ready for a pun!) glee. Whereas most characters in his situation would be either confused, annoyed, or otherwise unamused by this bizarre occurrence, Barry looks like he just won an all-access pass to the greatest thing to happen in the history of musical theater. Even Kara “Joyful Light in Humanoid Form” Danvers is puzzled by the singing and dancing more often than entertained by it, but Barry is almost always seen grinning broadly, clapping enthusiastically, or trying to surreptitiously memorize dance moves whenever a music number happens. It’s freaking adorable. After the big song, the plot-within-the-plot begins. Here’s a rundown: there are two warring gangster factions, one led by a man named Digsy “Not Joe West” Floss and his partner, “Not Martin Stein” (whose character name I don’t think we get), and another led by the Cutter Moran character. Barry and Kara are kidnapped and threatened into helping the Floss team find their daughter, Millie (Iris) because they know that Barry and Kara work for Cutter. The big secret turns out to be that Millie is in love with Cutter Moran’s son, Tommy (Mon-El), and they’ve been dating in secret. It’s all very straightforward and, for genre-savvy Barry and Kara, easy to manipulate. After Barry and Kara kick an apartment door down and find “Millie” and “Tommy” making out, we get our first significant break in the musical story to catch up on what’s happening in the real Central City. Music Meister is using the spell or whatever he put on Barry and Kara to siphon their powers. Eventually, we learn that there’s really no huge scheme that Music Meister is working, and this is just here to make us feel like the stakes are really high, so... don’t care! Back to the musical! Barry and Kara convince Millie and Tommy to tell their dads the truth about their love, which allows them to learn some things about their own relationships back in the real world. Barry learns that he needs to get back together with Iris because their love is important and he can’t let a thing like fear get in the way. Kara learns that sometimes people lie, but they should be forgiven. I’m... with you on that first one, show, but definitely not picking up what you’re putting down in that second Big Lesson. My reasons why exist in my Supergirl review. As a result of Barry and Kara’s convincing arguments, we get Jesse L. Martin, Victor Garber, and John Barrowman singing “More I Cannot Wish You” from Guys and Dolls and it is glorious. As usual for this episode, Barry is grinning like a freaking loon in the background. He even does a “are you guys seeing this greatness right now?” motion to the background gangsters. And he applauds at the end. I love everything. But alas, love cannot stop a gangster war and the three gather up their boys and their guns and get ready for a shootout in the streets. In the meantime, Kara and Barry perform one of only two original numbers for this episode, this one being “Super Friend.” It’s a song written by Rachel Bloom, of Crazy Ex-Girlfriend fame, and with quick lines like “I’m your super — that has a double meaning! — friend”, the fingerprints of her cleverness are all over it. Also, Kara and Barry tap dance. I love everything times a million. Unfortunately, this is apparently one of those musicals with a downer ending because the Gangster War begins and no one gets out unscathed, not even Barry and Kara. Is it weird that I'm genuinely sad the fictional universe within this fictional universe ended on such a depressing note? Poor Millie and Tommy. When the Barry and Kara lying in S.T.A.R. Labs start to crash because their musical alternative lives are fading, Music Meister informs Iris and Mon-El that the power of love really is what’s going to save them. Cisco vibes them into the other world and the respective loved ones of Barry and Kara pull them from the brink of death, waking them in a world where they’re superpowered and mostly fine. Music Meister flits off to whatever universe the show never explained he came from. But some musical magic stuck around, apparently, because the tiny speakers on Barry’s phone reach high quality, surround sound levels so that he can serenade Iris with the other original number: “Running Home to You,” written by Benj Pasek and Justin Paul. It’s cheesy and beautiful and Grant Gustin performs it wonderfully. Also, it doubles as Barry’s do-over proposal — for realsies, this time! — which Iris enthusiastically accepts. So Barry has been hanging around Cisco’s place watching musicals, in the dark, in his Gloomy Hoodie, for days. The fact that Cisco didn’t electrocute him with some tech out of sheer annoyance proves the man is practically a saint. There’s no League of Assassins on Kara’s Earth, which means that Arrow plot never happened there. Lucky them. “You’ll have to excuse my friend. He doesn’t think before he talks.” Barry doesn’t think before he does a lot of things, Kara. “I didn’t mean like, a gender thing — I just wanted to kick [the door] in.” I love that Barry clarifies that he really just wants to kick a door in because it’s fun to kick doors in. “Love will find a way! You can do it! Power of love and all that!” I really did like the Music Meister. He can return for #SuperFlashMusical Part 2: Glee Strikes Back.